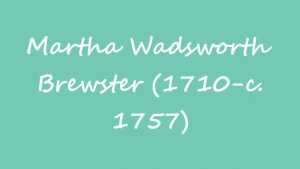 Martha Wadsworth Brewster holds a unique place in the records of 18th century US born poets in that she published her work using her own name, rather than a pseudonym which was more common among female writers. Additionally she was one of a select band of colonial women, numbering only four, who wrote poetry in pre-Revolutionary days. 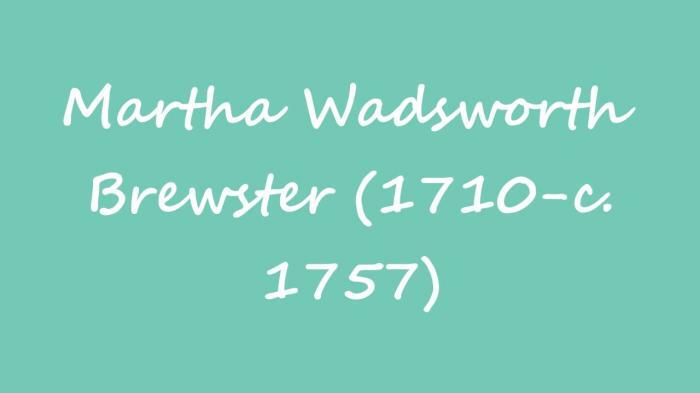 Her life is little documented but it is believed that she was born Martha Wadsworth on the 1st April 1710 in Connecticut. 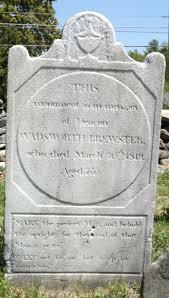 Her name changed to Martha Wadsworth Brewster on her marriage towards the end of March 1732. 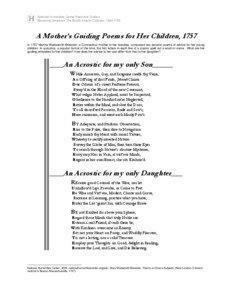 The marriage produced two children, a son called Wadsworth and a daughter named Ruby, and Martha wrote two poems dedicated to them in the unusual style of that time called “Acrostic poetry”. The basic premise of these pieces was that the first word of each line spelled out the name of her children in turn. 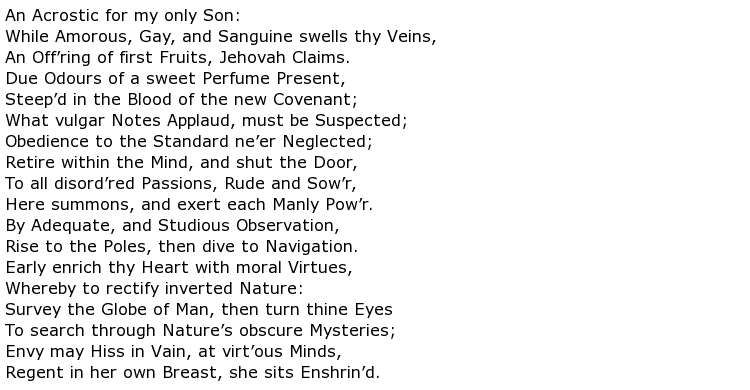 They were, effectively, words of motherly advice for her offspring and it is possible that they were written not long before her death in 1757.
which also includes items of prose and letter writing. It was more common for women to spend their time on the traditional fare of family and religious-themed work. As evidenced above, she did write about her family but also delved into more controversial areas such as the effect of invasion and warfare on the new settlers of America. sweeping the country at the time and she wrote about the schisms of this religious turmoil. She was never afraid to speak out about the rights and wrongs of such events and many literary historians have suggested that she was probably one of the earliest members of the feminist movement in that country. 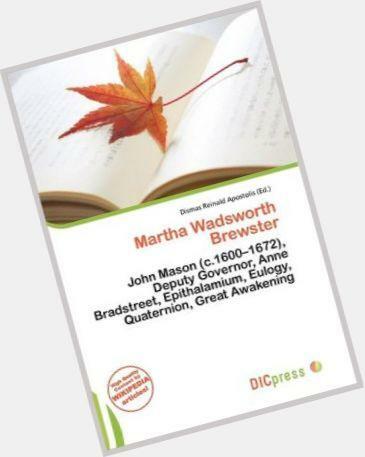 Some, at the time, doubted her ability as a writer though, and she was even suspected of “borrowing” work from other poets such as Isaac Watts. There is no hard evidence to support that accusation. Her work could often be found in single-sheet broadsides, these often taking the form of posters attached to outside walls for public reading. They were often used to convey news about real events and one of Brewster’s poems describes the fall of French-occupied Cape Breton when attacked by Britain in 1745. She could certainly be described as a pioneer for women writers and there is evidence that suggests that her work was seen far beyond her home location. 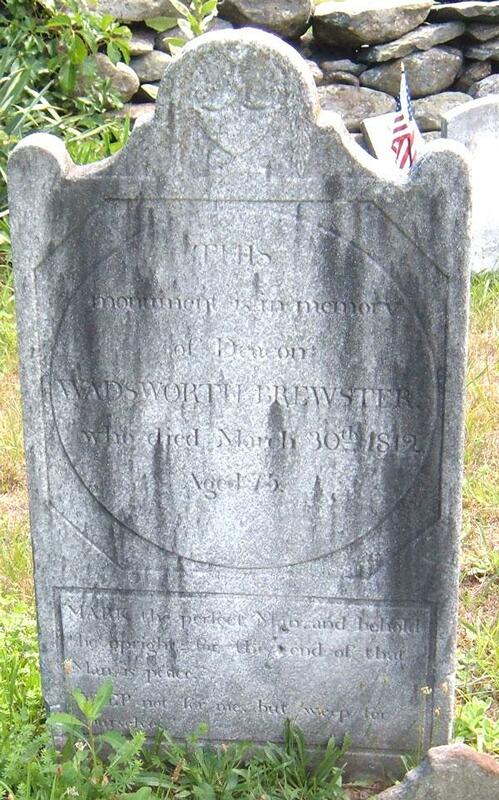 Martha Wadsworth Brewster’s date of death cannot be verified but it was believed to be sometime during the year 1757, thus making her 47 years old when she died. The enigmatic nature of this writer’s life continued up to her death with no record of her final resting place being available. It is thought though that she may have died in Lebanon, the town where she was born.